The study of magmatic plumbing systems of volcanoes (roots of volcanoes) is one of the main tasks facing volcanology. One major object of this research is the Klyuchevskaya group of volcanoes (KGV), in Kamchatka, which is the greatest such group that has been found at any island arc and subduction zone. We summarize the comprehensive research that has been conducted there since 1931. Several conspicuous results derived since the 1960s have been reported, emerging from the study of magma sources, eruptions, earthquakes, deformation, and the deep structure for the KGV. 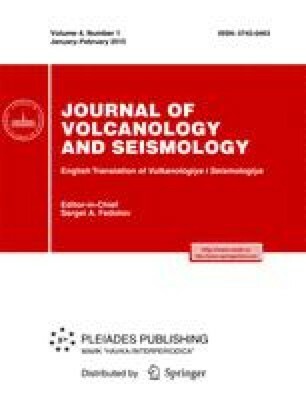 Our discussion of these subjects incorporates the data of physical volcanology relating to the mechanism of volcanic activity and data from petrology as to magma generation. The following five parts can be distinguished in the KGV plumbing system and the associated geophysical model: the source of energy and material at the top of the Pacific Benioff zone at a depth of about 160 km, the region of magma ascent in the asthenosphere, the region of magma storage in the crust-mantle layer at depths of 40–25 km, magma chambers and channelways in the crust, and the bases of volcanic edifices. We discuss and explain the properties of and the relationships between these parts and the mechanisms of volcanic activity and of the KGV plumbing system as they exist today. Methods for calculating magma chambers and conduits, the amount of magma in the system, and its other properties are available. Original Russian Text © S.A. Fedotov, N.A. Zharinov, L.I. Gontovaya, 2010, published in Vulkanologiya i Seismologiya, 2010, No. 1, pp. 3–35.